Give a printed or textured dress just a touch of shine with this thin, but intricate bracelet by Lele Sadoughi. 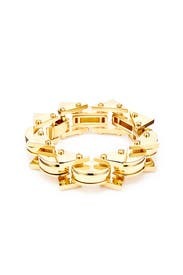 14K gold plates angular link bracelet connected by rivets. Foldover clasp. 7.25" long. Large for my small wrists. Too bright in color. Looks cheap. The bracelet for well but I have very small wrists. I was pleasantly surprised that nearly everything I planned to wear on my trip went with this bracelet. 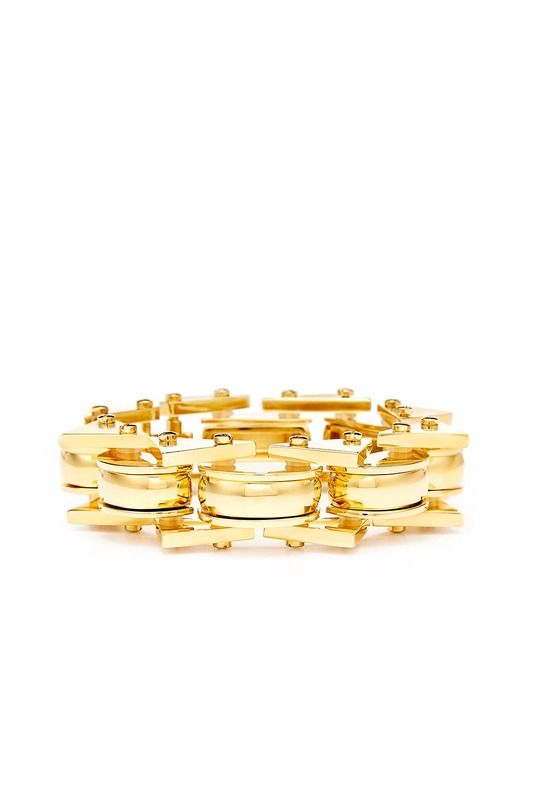 This bracelet was the perfect statement piece for a plain dress. It wasn't too heavy either. I received a ton of compliments. Gorgeous addition to an outfit. Way too expensive for one night however. Wasn't unforgettable. A little heavy, but not too bad. The triangles are a little sharp... I was at a concert and accidentally scratched my friend a few times so be careful! Amazing bracelet!! Want to keep forever. 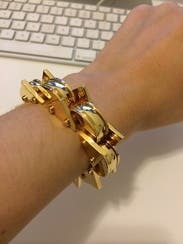 Really rich gold color, secure closure, small enough to fit smaller wrists without sliding around too much. The bracelet was heavy, well-made and a really unique design. 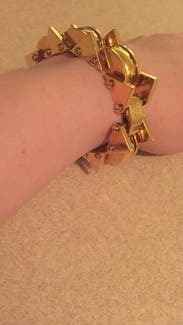 However, the metal was an odd gold color which cheapened the bracelet. Beautiful and catch peoples eyes. I have small wrists and this bracelet actually fits! Great quality!